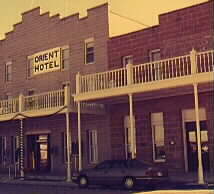 Built in the early 1900s of sandstone quarried nearby, the three-story hotel and attached No. 11 Saloon served travelers on the railroad and the Bankhead Highway - now I-20. Western and Spanish memorabilia fill individual rooms provided by area families and organizations. See Chuck Wagon where the Scarbrough/Linebery Family's Frying Pan Ranch chuckwagon is displayed, along with an authentic campfire.